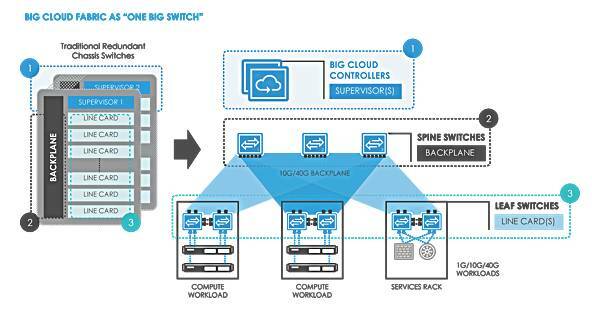 Big Switch Networks has updated its Big Cloud Fabric to support hyperconverged (HCI) and software-defined storage (SDS) products so they don't need to use shonky old proprietary networking hardware. Big Cloud Fabric (BCF) v4 came out a year ago with enhanced VMware support, multi-container networking, and scaling up to 128 leaf switches. We now have stronger HCI and SDS support. The BCF pitch is that proprietary networking gear can be sidestepped by using its software-based controller and white box servers and switches. Network components can be provisioned, orchestrated and set up programmatically through the BCF structure. It features single-click multicast and is integrated into storage suppliers' management consoles so they can be used as a front end. It claims provisioning of network resources for VMs or containers can become fully automated. Big Switch says that, when BCF is deployed, VM admins and storage teams get full network visibility and have configurable role-based access controls (RBAC), giving them the ability to push VMs live, directly into the network. It can be deployed on industry-standard switch hardware from Dell EMC open networking, EdgeCore white box, and the HPE Altoline family, and data centre networking software. Big Switch tells us: "VMware NSX deployed on Dell switches running Big Switch is lower cost than traditional networks from Cisco, and much easier to manage." On the HCI side it says BCF provides fast deployment of network resources and a scale-out architecture matching that of HCI systems. 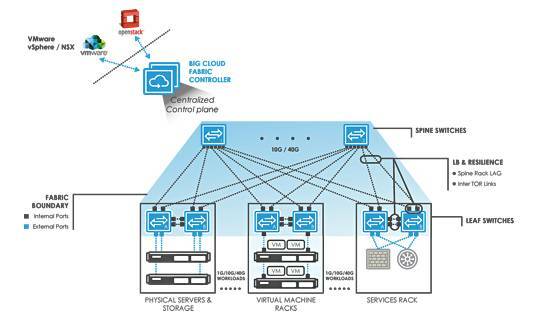 BCF supports east-west traffic across the server/storage nodes with its 10G/25G/40G/100G scale-out fabric. Big Switch has a resale partnership with HPE on its Altoline Datacenter switching line, and has have initiated integration testing with SimpliVity as the next HPE platform to support. BCF is a validated Nutanix Ready Core product for networking and a member of the Nutanix Elevate tech alliance partner program. Validated solution components consist of BCF, Nutanix AOS 5.1.0.3 and VMware vSphere ESXi 6.5b. For VMWare BCF forms an software-defined networking (SDN) underlay over which VMware's NSX, an SDN overlay, is deployed. BCF provides NSX visibility to network operators, so eliminating any overlay-underlay visibility gap. BCF also provides end-to-end troubleshooting in NSX, vSphere and vSAN environments. On the vSAN side, BCF provides automatic configuration of cluster networking and one-click multicast deployment with tools to help rollout and management. A dedicated vSAN dashboard has real-time and historical views of cluster events for troubleshooting. Dell and Big Switch have a reference architecture for the VMware SDDC, using BCF, ScaleIO, vSphere and Dell networking hardware. Big Switch says Ceph has two storage networks: a frontend application-facing public network, and a separate backend cluster network. Ceph-based object management instances use the backend one to write, access, duplicate and manage data stored in the objects. BCF's single SDN fabric supports both Ceph networks. There is no current NetApp product support by Big Switch.